Oops - we don't appear to have a video for the KV-S2048C. The Panasonic KVS2048C document management scanner benefits from Panasonics extensive experience in paper handling and performance and offers upto 600 DPI, Colour Automatic Cropping and Colour Automatic De-skew. 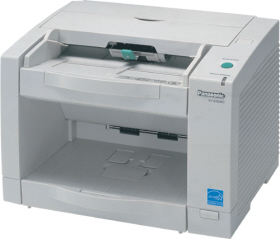 These compact scanners have high durability and reliable paper handling along with a scanning ability of over 3 million pages (one of the highest performance figures in its class). Ths scanner can easily handle paper weights of 50-127g/m and the paper rollers can be used for non-carbon paper.